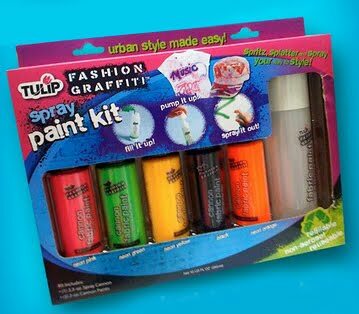 iLoveToCreate Blog: Winners of Tulip ® Fashion Graffiti Kit Contest announced! Winners of Tulip ® Fashion Graffiti Kit Contest announced! Here's the list of winners for the Tulip® Fashion Graffiti™ Spray Paint Kits! Each winner receives the kit shown above. Thanks for everyone who participated in our contest!! For more chances to win EVERY DAY, check out our new Giveaway page on our home page. We give a prize away each and every day! So, if you didn't win this time, you can try to win again! "I use Scribbles and Polymark to give my daughter's jeans a chic look. I paint flowers and butterflies on the back pockets. I've also used the paints in conjunction with OK to Wash It by Aleene's to stop runs in her fine knitted shirts. And I've used OK to Wash It on her Girl Scout patches to adhere them to her vest." "Upcycled bags with lots and lots of Paint Paint Paint!" "Using the stencils and spray paint in art journaling is so cool :"
I use Tacky Glue on everything! I would love to win the spray paint. So many possibilities! "I use your fabric paints along with tacky glue on assemblage art and stretched canvas paintings. They work great!"